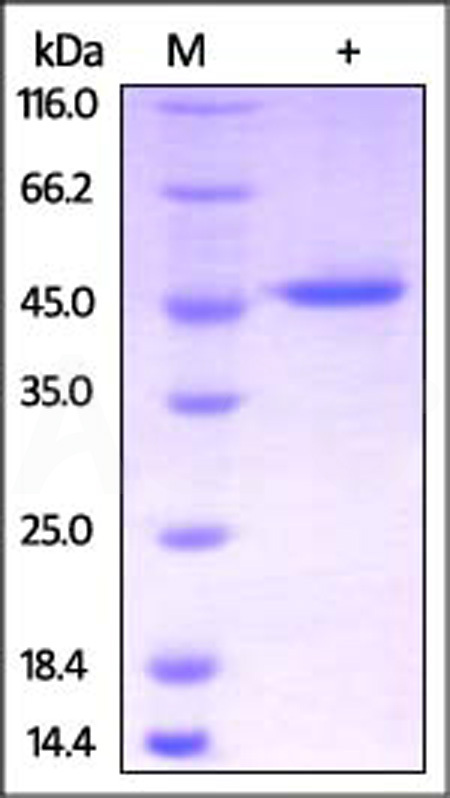 Human CKB, His Tag (CKB-H5143) is expressed from E.coli cells. It contains AA Pro 2 - Lys 381 (Accession # AAH19259). The protein has a calculated MW of 43.5 kDa. The protein migrates as 45 kDa under reducing (R) condition (SDS-PAGE). Human CKB, His Tag on SDS-PAGE under reducing (R) condition. The gel was stained overnight with Coomassie Blue. The purity of the protein is greater than 95%. Creatine kinase B-type (CKB) is also known as Creatine kinase B chain, B-CK and CKBB. CKB consists of a homodimer of two identical brain-type CK-B subunits. CKB reversibly catalyzes the transfer of phosphate between ATP and various phosphogens (e.g. creatine phosphate). Creatine kinase isoenzymes play a central role in energy transduction in tissues with large, fluctuating energy demands, such as skeletal muscle, heart, brain and spermatozoa. Furthermore, ectopic expression of the CKB in red cells and platelets is a rare, benign anomaly detected during a newborn screening program for Duchenne muscular dystrophy. (1) Daouk G.H., et al., 1988, J. Biol. Chem. 263:2442-2446. (2) Olsen J.V., et al., 2010, Sci. Signal. 3:RA3-RA3.